The Archer Heights Civic Association has announced that it is working to revise city laws to increase penalties associated with graffiti and other acts of vandalism. 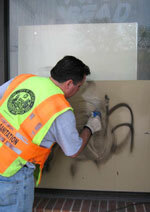 City worker removes graffiti from a wall. 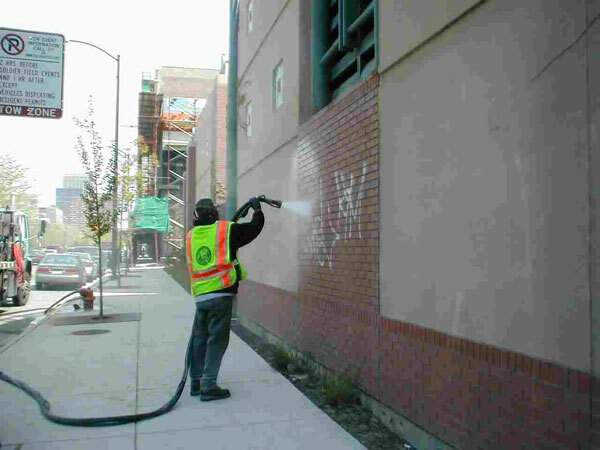 ﻿ "Our civic association, through our sponsorship of both the Archer Heights Community Watch and a Daytime Graffiti Patrol, has for years been in the forefront of trying to combat incidents of graffiti, tagging, spray painting and glass etching in our community," wrote AHCA Executive Director Thomas Baliga in the group's May newsletter. "These acts of defacement bring down property values, are expensive crimes against homeowners and businesses, and those convicted should receive more than just a slap on the hand from the court system." 8-4-070 Responsibility of Parent or Legal Guardian: Current fines of $250 - $750 against parents/guardians of minors convicted of violation of the code to be increased to $500 - $1,000. 8-4-10 Damage to Public Property: For persons convicted of violation, existing fines of “not less than $200 nor more than $500” to increase to “not less than $500 nor more than $1,000”. 8-4-130 Possession of Etching Materials, Paint or Marker with Intent to Deface Unlawful: Violation for each offense to increase from the current $750 to $1,000. 8-4-060 Vandalism Defined: Fine for conviction to increase from the current $750 to “not less than $2,500”. In addition to such fine, any such offense shall be punishable as a misdemeanor with mandatory incarceration of not less than three days and up to 30 days, or 2,500 hours of community service. The current code states that such offense “may” be punishable as a misdemeanor for a term of “up to 30 days” and or be required to perform up to 1,500 hours of community service. Beefing up this code and getting convictions will send a clear message to persons bent on defacing and damaging private property. According AHCA officials, the proposed changes are ready for consideration by the City Council, and they expect that 23rd Ward Alderman Michael R. Zalewski will introduce the measure soon. "Our civic association fully supports the 8th Police District Court Advocacy Program and hopes these increases in fines, along with mandatory jail time, will help clean up the community by making such acts costly to the perpetrators and their guardians, and assist the Court Advocates in their tireless efforts," Baliga also wrote. "Stiffer fines and mandatory jail time will encourage the victims of such crime to sign complaints and go to court. And showing up in court is key. For if a victim does not go to court, the case will be dropped. Hardworking homeowners and businesspersons should not have to pay increased property taxes and costly repairs, while graffiti/etching criminals skate free. Increased fines and jail time are a win-win situation for the entire City, as mandatory fines will provide a revenue resource for the hiring of more police."